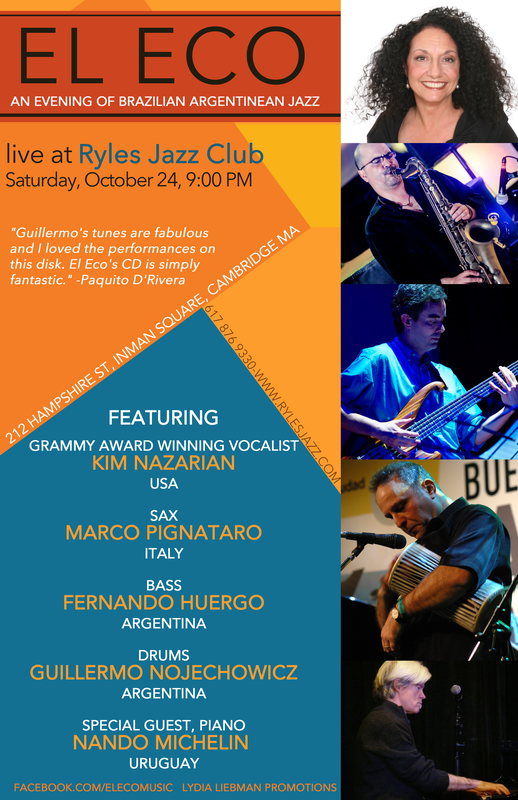 Cambridge, MA — EL ECO, featuring special guest Uruguayan jazz pianist Nando Michelin, will present an evening of Brazilian Argentinean Jazz on Saturday, October 24 at 9:00 PM at Ryles Jazz Club, 212 Hampshire Street, Cambridge, MA. Argentinean-Brazilian jazz ensemble EL ECO comes straight out of the heart of South America. Led by drummer and composer Guillermo Nojechowicz, EL ECO combines the swaying tempos of Brazil with the darker themes and complex rhythms of Argentina and Uruguay. Garnering praise from the likes of Paquito D’Rivera (who has called Guillermo’s tunes “fantastic”), EL ECO presents a unique and timeless blend of sophisticated Latin jazz. The band’s festival performances have included the Telluride Jazz Celebration, the Curacao Jazz Festival, and the Buenos Aires Jazz Festival. A masterful drummer and highly original composer, band leader Nojechowicz is also an international clinician and educator. He recently performed with his student ensemble and special guest Joshua Redman at Cambridge Rindge and Latin School through a collaborative program with Harvard University. He has also appeared at the Panama Jazz Festival with his World Jazz Ensemble students, and his music has been featured on NPR’s syndicated radio program ‘Jazz Set,’ and on Radio Nacional in Argentina. Nojechowicz is joined by vocalist Kim Nazarian, co-founder of the globally popular vocal jazz group, New York Voices. Along with Nazarian, joining EL ECO is saxophonist Marco Pignataro, who has shared the stage with Eddie Gomez, Joe Lovano and Dave Liebman, and bassist Fernando Huergo, who has played alongside Danilo Perez, Tom Harrel, and Bob Moses. The featured guest of the evening is pianist and composer Nando Michelin. Hailing from Uruguay, Michelin has performed alongside Jerry Bergonzi, John Patitucci and Antonio Sanchez. EL ECO can be counted on to deliver a soulful, swinging evening of its unique Latin sound at Ryles Jazz Club on October 24 at 9:00 PM. Ryles Jazz Club functions as a full service restaurant and bar.